The GMC Terrain is attractive, comfortable, and well-equipped. 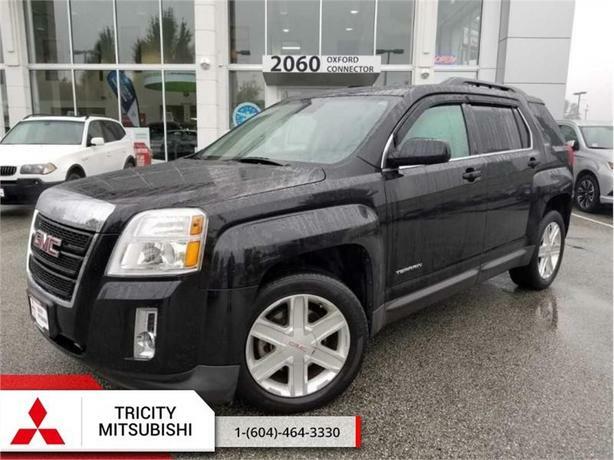 -Car and Driver This 2012 GMC Terrain is for sale today in Port Coquitlam. The 2012 GMC Terrain is a compact crossover SUV that is spacious, comfortable, and offers both the power and performance you're looking for. Its rugged exterior styling looks the part of the GMC family and the roomy interior offers luxury touches and room for five. Passenger and driver alike will appreciate the quiet cabin of the GMC Terrain. With a rugged, yet classy exterior and a comfortable, high-tech interior, the GMC Terrain is a premium compact SUV without a premium price tag. This SUV has 73412 kms. It's black in colour. It has a manual transmission and is powered by a 2.4L 4 Cylinder Engine. This vehicle has been upgraded with the following features: Leather Seats, Bluetooth, Rear View Camera, Premium Sound Package, Heated Seats, Remote Start.